As innovators in the air quality market our specialist air quality team at Timberwise are proud to launch their new positive pressure ventilation system. Our EnergySaver positive pressure ventilation units have always provided a reliable solution to condensation, mould growth and air quality problems within the home and our new enhancements make our units the next generation of positive pressure ventilation systems. The system works by introducing fresh, dry, filtered ambient air into the property. This ‘clean’ air is then circulated around the property diluting and displacing the stale moist air and ultimately reducing the humidity levels to control condensation. Our new positive pressure ventilation system for lofts has all the benefits of our original system and much more! A new state of the art digital motor – The positive pressure unit will constantly measure the airflow and keep the airflow at the desired rate. This new motor is also more efficient than our previous motor. A new LED light on the heat switch panel – A clear indicator to show when the filter needs changing. New style filter cover– Our new filter is now the largest available for a positive pressure loft unit giving clients an increased working life of the filter. Air is also now filtered from all sides of the unit. As can be seen from the picture to the left the new unit can now be hung directly from a rafter or a cross member. 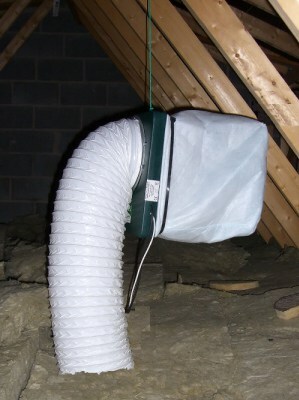 This allows a less intrusive installation than the traditional unit which was fitted directly on to ceiling joists. An added benefit is also less vibration and noise when in use. The loft unit is fitted into the roof void and ducted via an air diffuser, normally mounted in the ceiling above a stairwell. Where there is a pre heat facility a control switch is conveniently sited to allow the user to control the heat facility and the fan speed. For more information on our range of positive pressure ventilation systems or to arrange a survey call Timberwise on o800 288 866o. I have just noticed that somewhere it mentions a heat facility, is this as standard? And does this mean there is an option to heat the air that comes in during winter? Hi Deborah – The Envirowise positive pressure units have a pre heat facility as standard. This means that the automatic temperature sensor on the unit activates a pulse heater when the the temperature drops below 12 degrees C (preventing the unit distribution cool air ). Likewise when the temperature is above 12 degrees C it shuts off. There is also a manual shut off facility as well. Hope this help…. When you say there’s a manual shutoff… Does this involve going up the loft to do or if is there a switch downstairs in the landing? Also, regardless of this what I’m general wondering is, is there any switch/box/sensor placed in the landing at all or is the only thing that is ourside the loft the vent on the ceiling? Also, is there anywhere I can read customer ratings/views on your specific model as I can find loads on other makes but nothing on yours that is from people that have actually used it. Hi Deborah – There is a switch to control the pre-heat facility that can be sited at a convienient point for yourself – be it an airing cupboard or on the landing. We have testimonials from clients who have the system installed to help control condensation and improve air quality and can make these available to you if that helps you. Can postitive systems work in a Minor Surgical unit within a GP surgery? Can these units be fitted by qualified plumbing and heating engineers? I was looking for some information about a fan system, I have a living room with a wood burner installed the room is approx 7m x 5m, I would like to transfer the heat from that room to the upstairs rooms. Above the living room is a bedroom with a full length built in cupboard,which could house a unit. what I was looking for is a simple system, say a vent grill in the living room, through to upstairs cupboard, and a fan unit exhausting into the bedroom. is this feasible, if so can you suggest one of your products?